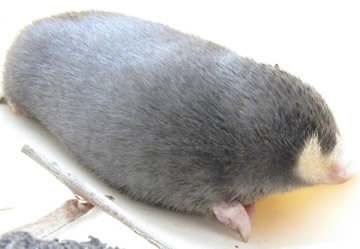 The golden mole, which lives in Africa south of the Sahara, digs holes and lives underground. It is a placental mammal and is insectivorous (eats insects). It lives in many different environments - beneath tropical forests, swamps, grasslands and deserts. Desert golden moles move through sand while other golden moles burrow under earth. The golden mole averages about five inches long. Its body is designed for a subterranean life. It has tough skin and thick, brown fur mixed with long iridescent golden, bronze, blue or purple hairs. The thick fur keeps moisture and dirt away. The claws of the golden mole are large and good for digging. Only the golden mole's hands and feet project beyond its body. The rest of its limbs are inside the body, so they do not get in the way as the mole travels through narrow tunnels. The golden mole is blind. Its eyes are covered with fur and skin. Its nostrils are covered with leathery pads. It has no external ears. It hears through small openings in its head. It is extremely sensitive to vibrations. Although the golden mole resembles the common mole in its appearance and its burrowing behavior, it belongs to a different order of mammals. This is an example of convergent evolution, in which unrelated species develop similar physical characteristics, often as adaptations to similar environments. Both golden moles and common moles have physical characteristics that enable them to live underground successfully. Based on genetic evidence, scientists think that the golden mole should be in the same order as the tenrec. Golden moles and tenrecs have been placed in the order Afrosoricida.